AIATSL Recruitment : Air India Air Transport Services Limited (AIATSL) is looking for bright and energetic Indian Nationals (Male & Female) to join us as Security Agents on a Fixed Term Contract for a period of 3 years at Jaipur. Interested candidates who fulfill the stipulated Eligibility criteria as on 1st Feb, 2019 are required to register themselves online by filling the ONLINE APPLICATION FORM and are also required to WALK-IN in person along with the DETAILED Application Form duly filled in (as attached along with this advertisement) along with the Documents mentioned in checklist in Original as well as one set of self – attested documents supporting their eligibility. Brief Information about AIATSL Recruitment Has Given Below. Candidates are also required to bring an A/c Payee Demand Draft for an amount of Rs. 500/- (Rupees Five Hundred only) in favour of “Air India Ltd.”, payable at DELHI, as non- refundable Application Fee (Not applicable for SC/ST/Ex SM). Please mention your Full Name and Mobile number on the reverse of the Demand Draft. In addition to the above, on acquiring/having valid Basic AVSEC qualification & XBIS certification, an additional allowances i.e Rs 1000/- for BASIC AVSEC and Rs 1500/- for X-BIS will be paid as applicable. 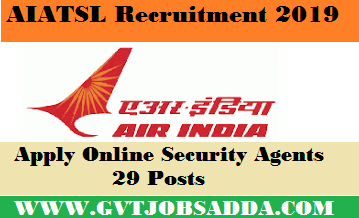 Fore More Details About AIATSL Recruitment Candidates Should Visit Official Website Of Air India & Read Official Advertisement Regarding Security Agents Posts Before Apply Online.